So .. you're thinking about taking up Sea Kayaking! which started with a handful of Klepper Folding Kayak Owners in Manhattan.! Sea Kayaking Articles, Stories and other tall tales from your bretheran on the water! Tip, Tricks and Tips!Those little items we've learned along the way! Sea Kayaking Camping:For those nights when Motel 8 won't do! Blowing in the Wind: On your TERMS !!! Navigation: How to SURVIVE the SEA TRAFFIC RUSH HOUR! Love on the High Seas: Misadventures of those amorous Sea Kayakers. Letters to the Editor:You tell it like it is! How to's We can all learn something new! Photo Gallery: Your rare moments captured in those intimate places! Salty Doggers LIST: Trips, Get-Togethers, Put-Ins & Outings! PADDLE NYC - FREE !!! Try out a kayak in the shadow of the skyscrapers! NUTRITION FOR KAYAKERS A mineral deficiency can keep you from paddling ? The New York Kayak Company! Visit for the latest in foldable kayaks! The Salty Dogs Themselves: Who created this ZINE ??? The Hudson River Watertrail Association - the definitive guidebook to the Hudson! A FOLDING BICYCLE for FOLDING KAYAKERS! ! NEW: COLD WATER WORKSHOP! - Jot down these notes and play it safe. HYPNOSIS for KAYAKERS - The mindset to paddle on! SEA KAYAK TIPS .. KAYAK TRICKS .... KAYAKING ARTICLES .... KAYAKING NEWS .... KAYAK FUN ..... AND MORE .... !!!!! AND THIS WEBZINE ON THE BOTTOM OF THIS PAGE !!!! Gadabout Gaddis was an inspiration to millions of young men in the earliest days of TV. He was known as the Flying Fisherman. 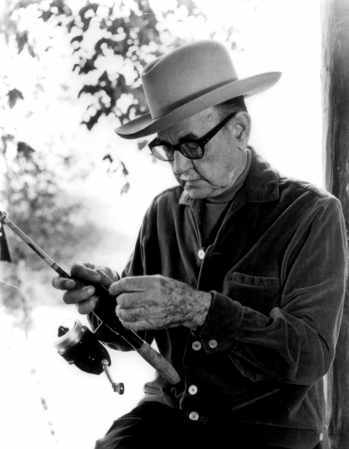 Gadabout Gaddiss shared his love affair with fishing with the American public. He was the grandfather everyone wished they had and during World War II, Gad entertained the troops with his stories of fishing.. This is my tribute to Gadabout Gaddis. I designed this site over 15 years ago. Old fans of Gadabout keep stumbling over it and they write me touching emails saying how their memories of childhood just come up. A simpler time when they woud sit in front of a TV on a saturday afternoon and for 30 minutes allow Gad's fatherly voice to fill them as he shared his life and love of fishing as his float plane flew into isolated grandeurs of beauty. Even today when I look at one of Gad's videos, those simple 16mm movies are still holding the test of time. Isn't it amazing, in this day and age, we keep remaking the old movies, hits of the past. Tv producers copy shows from an earlier generation that were staples of American culture. Makes you think .. huh ?. So travel back with me on these pages to a simpler time .. when people communicated face to face ... take a trip to Gad's world. SEA KAYAK LINKS.. KAYAK ARTICLES....KAYAK HISTORY IN U.S. .. NYC KAYAK STORIES ..... NYC KAYKING AND HYPNOSIS ON THE HIGH SEAS !!!!.... !!!!! -SOFTWARE FOR SEA KAYAKS - TIDE CHANGES, CURRENTS - IT'S ALL HERE ! in a center. There are run-ins with Coast Guard, Oil company tugs, scaling sea walls and more! "LEARN TO PADDLE SERIES "
SEA KAYAK LINKS.. OTHER AREAS OF INTEREST .... OUR SPONSOR NY HYPNOSIS ....... AND THE HISTORY OF SEAKAYAKING IN NYC !!! NYC's leading hypnotherapy clinic to stop smoking, weight loss, motivation, sports improvement, general health and well being, stress and more. Check us out. We're all NYC kayakers. THE HISTORY OF SEAKAYAKING IN NYC WITH JOHN PETROCELLI AND BOB HUSZAR !!! The Metropolitan Association of Sea Kayakers) in NYC about 15 years or so ago (maybe longer) in the United States. Back then in New York City, every beginning sea kayaker either owned a German Klepper folding kayak or they didn't own a boat at all. Plastic sea kayaks were not even in prototype stage yet and the sea kayaking market hadn't really been established. Although across the pond, In England, kayaker designers were working on developing the prototypes for the first fiberglass sea kayaks. A sleek design emerged called the Nordkap. It was meant for advanced paddlers because it had poor initial stability, but if you had the skills, this beauty cut through water and waves like a knife through butter (The double klepper folding kayak was affectionately labeled - 'The Sea Slug'. It moved. It was roomy (you could pack gear for a month's expedition). It was strong and stable, and if you paddled as much as we did, your body developed to meet the challenge. It was a blast for sea kaykers back then in NYC. We had the waterways all to ourselves. The tricky part was, it was extremely dangerous just getting in and out of the water as there were very limited and treacherous access points along Manhattan's waterways. As the first year went by with our fledging organization (called M.A.S.K.) we grew. Sometimes from 3-40 hardy paddlers would show up an hour or two earlier along some beer can, broken glass and sharp rock strewn site along NYC's waterways each lugging 2 sacks containing close to 110 lbs. of unassembled hypalon rubber, tightly meshed canvas skin and Birch wood interior boat frame folding boat which were lugged in the open trunks of NYC cabs or through the NYC subway system. The boats (most of them, were 17 foot, 2 seater models. We were a site to NYers and tourists alike as we assembled our kayaks along the debris-ridden sea walls of NYC. We then carefully lowered each boat down long the slick, oil-encased ea walls using frail 'climbers' ropes, doing our best to avoid glass, rats, sharp, oil-encrusted pilings, rusted steel spikes and sometimes waves which rammed us relentlessly up against the seawalls. There was no put-ins (a 'put-in' for new kayakers is like a floating ramp or a driveway into the water that offers easy and safe accessibility) in New York City for kayakers at the time. Because of the efforts of our M.A.S.K. group, Bob Huszar formed an offshoot - the Hudson River Watertrail which set in motion the precedent for other environmental groups to follow ... major groups ... like those who over the last few years completely redeveloped the waterfront along the Hudson into beautiful parks and a system of put-ins for kayakers emerged. It's amazing ... the actions of a handful of kayakers whom were continually arrested (the NYC police boats didn't understand the law, that we as small boaters had a right to be on the Hudson) and we were continually hauled down to the precinct and when they tried to charge us, well ... heh heh ... they had to let us go (talk about ignorance of the law).. The Salty Dog Webzine contains those articles which appeared in the first four years of the M.A.S.K. newsletter. the polluted waters of the Hudson and got them paddling. Now, sea kayaking has been established in the U.S., which is comical as I was told I was a fool. No one wanted to kayak in the Hudson. Sea kayaking would never take off ... after all ... it was jet ski's that were coming into fad. JFK jr. (his pre-flying days) joined us and we took him out on his first trip. He even had two boats stored at the Downtown BoatHouse, another successful off-shoot with members whom originally came from M.A.S.K. heartbeat from the old world trade center site. You can find him here! tours of the Hudson from a barge located near 25th Street in NYC and the Chelsea Piers. whole ball rolling for the redevelopment of the Manhattan Waterfront and the Parks Commission. We hope you enjoy these articles contained within. As you notice, when these were written, there wasn't specific kayaking gear. We had to borrow from other industries and sports. You could imagine how we looked in those rag-tag days: Wearing fisherman's thigh boots, long rubber fisherman's glove in the winter which made it extremely hard to grasp a paddle. We wore scuba diving wet suits which cause our arms to chaff from the constant rubbing. Yep, we were a sight. So enjoy the pages and remember,you're perusing the history of the Sea Kayaking movement in America ... from the famous German Folding Sea Kayaks that were around from the early 1900's and were used in military expeditions during the war ... and now to the Hudson River and beyond .... again ... enjoy ... and if we peaked your interest in trying your hand at sea kayaking, you're in for a wonderful experience that's addictive and a wonderful way to get some exercise. MUCH MORE SEAKAYAKING ARTICLES TO FOLLOW !! !